Dining Employees enjoying coffee at our Coffee and Chocolate Demo. New FRESH Demos are every Wednesday at Corcoran. Dining Managers create new dishes at Boston Public Market. Check out our fun and tasty events happening this month! GET mobile ordering is available in the Loft, CoRo, Hillside, Legal Grounds & Stuart Hall! Once you’ve downloaded the GET MOBILE app, you can use it to place your order and pay with a credit card or with Dining Bucks on your Eagle-One card. There's no reason to wait in line. Order from your phone and it's waiting for you when you want it to be ready. Every Wednesday by the fireplace, you can watch a demo and purchase your meal inside the servery. Check out the FRESH to Table webpage, the calendar explaining what will be demonstrated, and the Kitchen Confidential video. Gain valuable skills in today’s job market at a place where food and community meet. We offer positions with competitive wages, incentives, flexible hours, opportunities for advancement, and great working atmosphere. Eating balanced in college can be challenging. Check out our tips and read the article that was in the NACUFS Campus Dining Today magazine, beginning on page 17. Introduce more healthy meals into your diet with BC Dining Recipes! 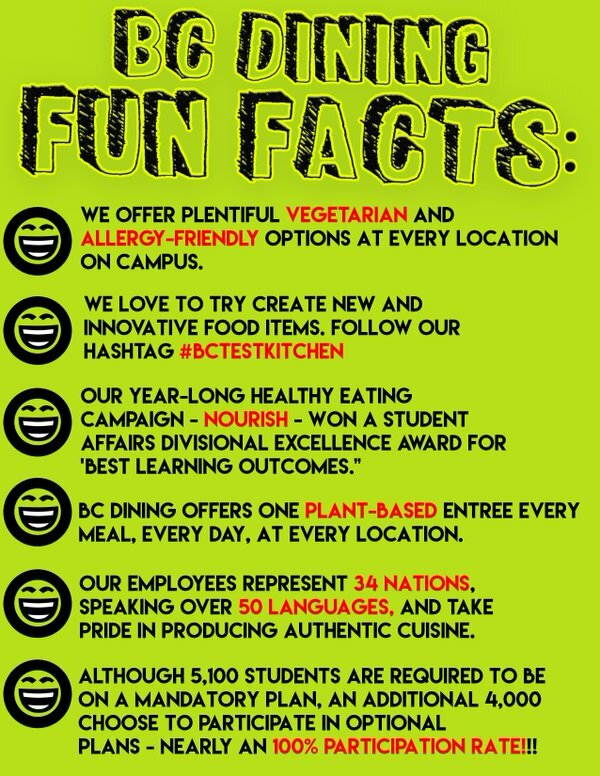 Here's some cool info about BC Dining.